Ever wondered how much a 'real' guitar player knows about composing, writing, strings, guitars and the sound of guitars? "It goes without saying that all my knowledge is second-hand (whose isn't?) but at least it's confirmed by experience and by communication with internet guitar folk!” said David Kilpatrick. This all started with David sending me a delightful CD of beautifully played guitar stuff in a style which I just love....cross between Gordon Giltrap and Segovia...a style which crosses country with folk, classical and Old English....I just loooooove it, even if my first love is Hip Hop/Garage!! “Now I see the guitar coming through in you, David...I listen to Gordon a lot, in fact he tried to get me to do a dance version of 'Heartsong' using samples, but tragically there IS no way that that particular rythmic pattern will fit. I love the way you put together your stuff...two of our road crew play in exactly that way:- classical/folk/old English. From a *producer's* viewpoint why not compress the guitars to h*ll (will push the sound out of the speakers much more)and use a much brighter eq'ed reverb with a much more obvious predelay timed to the tempo of the track. This will make the hammer on's and pull off's really come to life. I love recording acoustic guitar and consider myself to be one of the best around, maybe it's my studio? But the guitar sounds are quite mindblowing when you apply *today* techniques....ask Gordon! Your guitar sounds quite dead by today's standards (old strings?) As I always say: "Happy Birthday to the strings". I restring each and every session and insist that any session player I use does the same....no excuses taken. What a d*ck I felt when David mailed me back....whoops! Of course, the tracks I sent you are nylon string guitar - and they ARE compressed to hell and with a bright reverb! You are not the first person to mistake them for steel string. I get a lot of comments about how BRIGHT the guitar sounds from professionals and Lowden have sold more than a couple of S25Js on the basis of those recordings! One guy bought the CD in the States thinking it was some kind of very mellow steel string and then searched out an S25J for himself - $2,200 second hand but worth it. I fear that restringing for every session on a guitar like this would be counterproductive. Apart from the special polywound trebles being almost impossible to obtain and costing £15 a set, they take about 3 days of playing before they are stable enough for a recording, and about 6 weeks to reach their optimum brightness and sound. They then hold out for about a year, and it's a big mistake to change them. The basses, on the other hand, need changing about once a month; they still take three days to reach tension stability, but they wear out. Nylon string jazz electro-acoustic is very popular right now - Craig David etc - for little ornaments and riffs, but tends to drop into the background of most mixes except when the engineer brings it up for a solo. Provides a kind of thickening-up especially to the overall bass sound. I like it as a solo thing in a more sort of ambient context, just gentle music to sit there in the background in its right. “David, just shows you how much I know about guitar: "what guitar do you play?"... "A black and white one"
That was a big 'whoops!' from me....nylon eh? It's strange how minds work when listening...because of the genre of the music I automatically thought 'bright steel Gordon Giltrap'. One thing we will have to agree to differ on is : "I fear that restringing for every session on a guitar like this would be counterproductive. Apart from the special polywound trebles being almost impossible to obtain and costing £15 a set, they take about 3 days of playing before they are stable enough for a recording, and about 6 weeks to reach their optimum brightness and sound." So, we'll agree to differ on the 'new strings'....but if you come to play in my studio I would ask: "New Strings?" "naaaaahhh, ya see...rubbish- rubbish- rubbish".. I usually say "New strings or out"..."No new strings with you?....no problem....put these on, I'll deduct from the session fee." I played golf at a celeb. day with a high powered guy [chairman of Photobition]...he played guitar a bit and I asked how often he changed his strings...he started on this whole deal like you have in your mail [yours comes from knowledege, his comes from lack of it]. Of course, he would not have it! At the half way house my pal, John Lodge (Moody Blues), was there...I asked; "How often do you change your bass strings John?"..... "I've finished the American tour and my tech. changed them every second night.....whether I liked it or not! ".....I said: "Great tech,"...he said: "You're damn right!" “David....Of course I was not referring to classical/nylon in my *ranting*....just the steel string guys....who *annoy* me to death! But not as much as drummers. I spent 25 years of my life with a bass player partner who didn't change his strings ONCE in that 25 years! He never played on any of our recordings/TV or Radio, as it happens, the only time he did, I has to secretly borrow his bass, re- string it and slip into Decca to replace his playing....he never found out....probably didn't care anyway! In The Mandarin Hotel, Hong Kong, when we played a four week season I broke a string, put the guitar down for the next number [in which i didn't play anyway]...turned around to pick it up again and it was re stringed....the Philipino piano player just smiled and gave one of those lovely Oriental bows....I couldn't resist it [stupidly] I said: "Nice one, but you could have tuned it"....He was distraught....different cultures have different sense of humour. Afterwards I bought him a drink and asked him; "How?".. He said: "Ah, my brother plays guitar in band in bar downstrairs"
You guessed it....22 flights down, restring, tune and back for next number in the show! I lost that tuning art years ago...when I re string I can do it to 'near as damn it' but on stage, if a roadie knocks one of my guitars putting it in place I am totally b*ggered...lost the art of tuning 'on the fly' so long ago! "Legends or what? 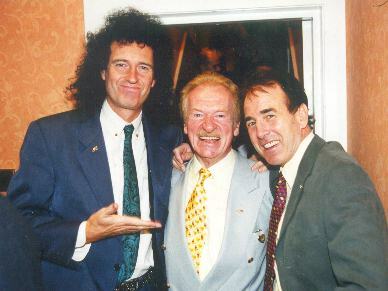 Brian May, Bert Weedon - who taught everyone with his: 'Play in a Day' book....and Dec"
Steel Nylon Gut...don’t confuse them! This is actually quite important - don't confuse steel and nylon or gut on the new strings front. Really important. Ask any classical concert player! Please don't advise immediate pre-session changing for nylon strings; instead, insist that any classical or nylon string player has strings which are recently fitted and fully played in to optimum tension and brightness. Personally I would always politely suggest that premium quality, high tension concert or recording strings are essential. You'd be surprised how many good classical players buy cheap, student-grade soft tension sets. I would agree with you entirely on new steel strings for ANY rythm, lead electric, and certain styles of acoustic steel; for example, you can't really do a Roger McGuinn 12-string or accurately follow Paul Simon without brand new, bright, crisp strings. It's very important to string up and practice (gently) for a couple of hours before recording, because during the first two hours of playing the tone of phosphor-bronze will change substantially, in addition to slight stabilisation of tension. It changes most on strings 3 to 6 in tone, and most in tension stability on the unwound trebles - especially in the first half hour with both. With luck you'll get two days of stable, excellent sound for a fingerpicker using a thumbpick or plectrum, with non-acid skin; a week for a bare finger player with very dry clean hands (like me); an hour for an acid-skinned, sweaty cigarette chainsmoker; ten minutes for a thrash metal expert with a habit of walking past straight past the washbasin in the gents! If you do change strings right in the middle of a session, it may be very difficult to match the sound if extra takes are needed. The strings should be just old enough - that critical couple of hours of practise playing, not hard use - to ensure they stay stable for a whole day's recording. How do you get round bottom end ? There are many fingerstyle players who use strings for about a month and actually avoid them when brand new, as they prefer a slightly mellow, fuller bass sound which seems to come from strings after a day's use. Which strings change sound quickest: ? There are substantial differences in the initial sound, and the change in sound, between phosphor bronze, white bronze, 80/20 'vintage' bronze, 'brass' bronze and nickel. Introductions such as 'zebra' strings with mixed nickel steel and bronze (to give a better response from magnetic pickups on acoustics) or the Gore Elixir strings which are coated with a polymer layer to reduce squeaks and extend string life make it more complex. Brand new Elixir strings sound like 'bare' D'Addarios after a day's use (some consider this perfect) and hold this sound for maybe four times as long as strings without the coating, after which they go really dead suddenly. Several guitar makers now fit Elixir to all new instruments - they reckon it prevents 'Stairway to Heaven syndrome' in retail stories ruining the strings quickly and giving their guitars a bad name! The only difference is that with nylon or classical strings - and not all are nylon, especially the best - this is the worst possible advice. Nothing sounds worse than new nylon trebles. They are, when you put them on, almost 20 per cent FATTER and lower in tension than they will be after roughly 3 days (in normal temperatures, with playing). Any player will notice a marked improvement in brightness and clarity of tone during this period. However, it doesn't end there. The tone of nylon strings improves for several weeks, as the material stress-conforms and its structure alters slightly. Most experienced classical players do not keep a pack of new strings in case of emergencies. They could never change a treble string mid-concert for a new one; they would be constantly retuning, and the sound would be quite flat or dull. Instead, they keep the OLD STRINGS they last took off (by the time they do this, the 'knot' for the bridge has hardened nicely and stays intact, so restringing is very rapid with an old string). How about the kink at the post hole though ? Originally, the string will have had many wraps round the tuning post, so there is little risk of breakage when restrung; the old 'kink' for the post hole need not be re-used. An old E, B or G string is the best emergency replacement! Which Makes? What’s the difference ? Today, string makers have introduced new composite materials and the Italian makers have created an artificial 'gut'. Savarez use a finely stranded, fleece-like core of nylon wrapped in a fine white hard polymer, for special E, B and G strings. Alternatively, they pre-stretch the trebles and then grind the surface down to an exact cylinder. La Bella do the same and machine polish the trebles AND the wire-wound basses. D'Addario make a brown polymer which is harder than nylon and very 'dark' in sound, but only use for the difficult G string which can sound so dead and plonky otherwise. But they still throw in a traditional clear nylon G string in the set, in case the buyer is used to the naff sound of typical student classical guitars and WANTS this dead, thick, expressionless sound from his G! New tech V Old Tech ! All these 'new tech' classical strings cost about twice as much - or more - but they have big advantages. They take only a few minutes to reach a stable tension, and they sound bright and crisp right out of the packet. Even so, they are still a flexible nylon at heart, and need a few hours to be stable in tuning. Visit David's site...apart from being a guitar knowledge guru he is top of the tree in camera and photographic knowledge...could he help you? Copyright © 2000 - 2006 The Serious Writers Guild. All rights reserved.